CA specialises in enhancing the performance of software and systems engineering projects. Our mission is to advance our clients' ability to reliably deliver systems that are safe, fit for purpose and cost effective. We provide consulting, contracting and training services to both the owners and the developers of software intensive systems. We believe that our systems engineering disciplines are much more than our collective memory they are our collective treasure. We owe it to future generations who we will never know to practice them, improve them and pass them on. To learn more read our Capability Statement. For case studies click Services on our menu bar. Requirements patterns. You can improve your ability write concise requirements by using requirements patterns. Patterns express each class of requirement with a predefined statement template. Using templates you will instantly improve the quality of your work even if you are not good at English expression. Learn more. 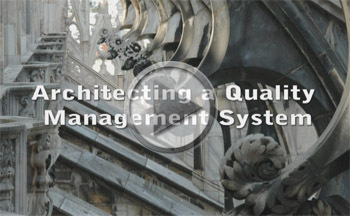 How do you design a quality management system?